Sometimes I think clothing items can be over-blogged and over-worn. I feel that way about the Zara skort that was so popular this summer, black Celine bags (however gorgeous they may be), Valentino rockstud heels, and Hunter rain boots in every single color. Once something (or it's knock-off) has graced all of the style blogs, it's no longer fresh or surprising, no longer new. I appreciate bloggers that wear the new, the adventurous, and the odd. Sometimes I may not agree with the print combinations or the cut of a certain dress, skirt, top, but I appreciate the unexpected. If you follow The Sartorialist, Scott Schuman, is always capturing the most bizarre combinations of pajama pants and Birkenstocks with socks, giant jumpsuits in 80s prints, baggy all-denim suits and more absolutely kooky clothing combos (menswear in crop top form? a jean jacket overall?) that make you scratch your head. But I'd rather scratch my head than yawn. When I was looking for rainboots this Fall, the Hunter boots were the obvious pick. They're a status symbol (I have $140 to spend on rainboots!) and they are worn by darling bloggers in every season. They also come in every color under the sun. But I couldn't bring myself to buy them because they've been done too much. So I picked up these amazing Sperry's (pst, they're cheaper too) that I am totally in love with. I don't see much of this style around (perhaps its more common in the Northeast) and they make me excited for gloomy, puddle-jumping weather. The insides are fleece lined, the entire boot even down to the laces and rivets feels high quality, and they go perfectly over ankle length jeans without bunching up the fabric around your calf or knee. Inspired by the downpours lately, I've also been thinking about Beatrice Potter's Jemima Puddle-Duck, the not-so-smart duck always getting into trouble, and that has the absolute best name I've ever heard. It was a childhood favorite and reminds me of my Mom reading to me before bed. Here's to puddle-ducks that make you nostalgic, deep Oregon puddles, and awesome rain boots. Love the boots, top, pants!! Nice outfit!! the sperry boots are my favorite - I have the LLBean version! i love your blouse! it is super cute!! Those boots are perfect for the rain you had...cute, comfy & functional! 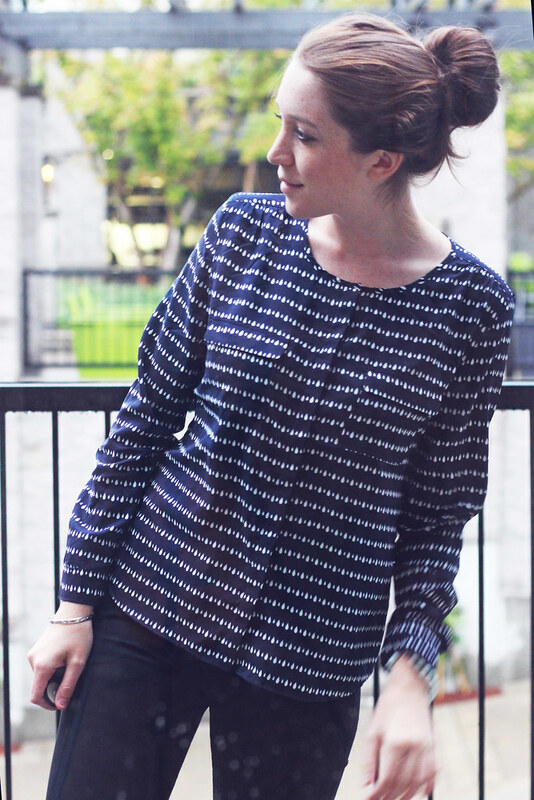 love the post title and love this outfit even more- so comfortable and cute for a drizzly day. 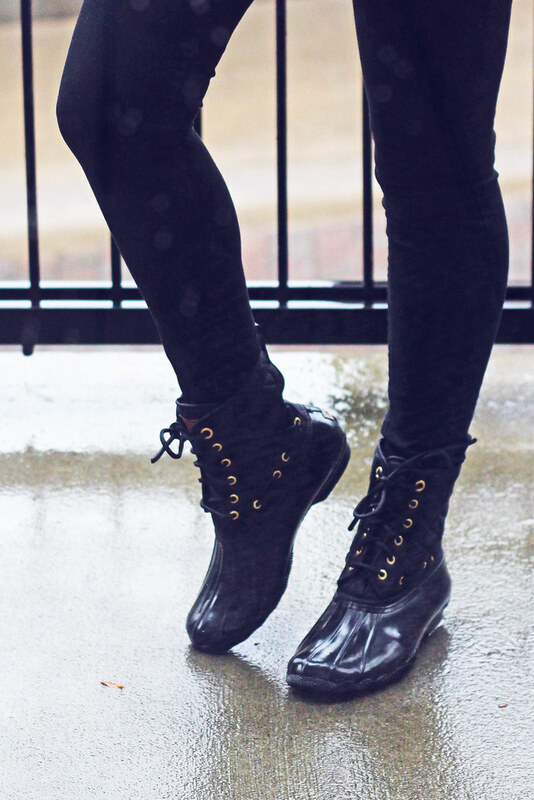 Those boots are so stylish and perfect for rainy days! What a great casual look on you. I have to admit, I am a Hunter Boot lover, I have 2 pairs. Excessive I know. Even more so when I admit that I want a pair of Duck Boots too ever since I saw Sarah Vickers wear a pair with a dress last winter. I was fully expecting to see hunters when I got to the bottom of the page. However since you live in an area that has severe weather now, I really recommend Superdry for jackets and hats and mitts. They're a bit expensive but they're worth it. love the sperrys! hunters are everywhere -- it's nice to see a different style. i actually have LLBean rainboots that look pretty similar and they're such an essential in the rain & snow. it looks like you def need them in oregon! Those rain boots are the cutest! While everyone does have Hunters, they really are the most comfortable rain boots that I've tried on. I didn't know Sperry made some, but I love yours! Great pick and they look so stylish. Hunters are such a staple in Vancouver too. I agree though it's nice to see something original! Agree with your post completely and love your originality. Still managed to look beautiful in the rain too! I really enjoy your blog and would love to follow each other—please visit my page and I'll follow you back! I see this type of boot all over my college campus in Eugene, OR - maybe it just hasn't trickled up to Portland yet! I have a pair of knee-high Sperry Topsider rainboots that I got instead of the usual Hunters and I absolutely love them!